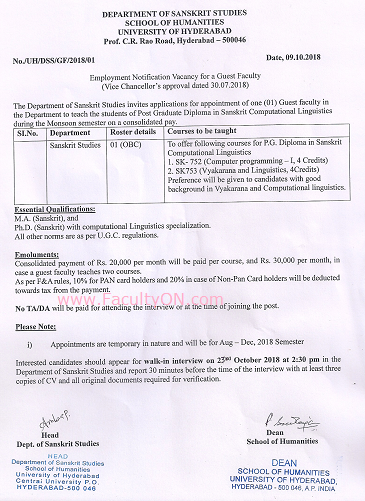 University of Hyderabad has advertised for recruitment of Teaching Faculty- Guest Faculty jobs vacancies. Interested and eligible job aspirants are requested to walk-in on 23rd October 2018. Check out further more details below. About University: The University has Twelve Schools of Study - Mathematics and Statistics, Physics, Chemistry, Life Sciences, Humanities, Social Sciences, Management Studies, Sarojini Naidu School of Arts & Communication, Engineering Sciences & Technology, Medical Sciences, Economics and Computer/Information Sciences. While some Schools are single-discipline Schools, others have Departments and Centres attached to them. There has been a special emphasis on promoting inter-school and inter disciplinary teaching and research in the University. How to Apply: Interested and eligible candidates are requested to appear for Walk-in interview with CV, originals and copies of certificates and recent PP size photos to the Walk-in address provided below. Hyderabad- 500 046, Telangana, India.